Author(s): Mumford, Robert E., Jr.
Robert Mumford received a BA from U. of Rochester and an MA from the U. of Colorado. He served 24 years in the Navy, rising to the rank of Captain. He has been a professional photographer for 28 years. 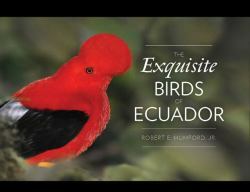 The Exquisite Birds of Ecuador by Bob Mumford, is a masterpiece of beauty and wonder. With a size of 33x3x26 cm. the book brings these very colourful birds to life. The technique used by Bob is a natural wonder, as the birds seem unafraid of the intruder. Bob has produced a marvellous showcase for Ecuador's avian diversity. "Seeing (birds) is one thing -- obtaining really photographic images of them is quite another, and where Bob Mumford really excels." -- Robert S. Ridley, President, Rainforest Trust, and author of The Birds of Ecuador: Field Guide.